The guy at the corner store is used to me coming in at midnight or one am to get my groceries, but even he raised an eyebrow when I sauntered in sometime past four this morning to pick up something for breakfast conduct a leisurely discussion of Indian cricket. What do I know about Indian cricket, you might well ask? You might well ask indeed. I was on my way back from the “secret” (secret if you live in a yurt in Outer Mongolia and/or haven’t checked your Facebook/Twitter/Myspace (ha ha, just joking about that last one, plus I’m almost feeling sorry for Rupert Murdoch’s moribund turkey of a website) in the past week) Foxboro Hot Tubs show at Jesse Malin’s Bowery Electric. Foxboro Hot Tubs, as you all will of course know, consists of five Green Day members plus Prima Donna’s Kevin Preston, and they play a rather tight but sodden version of the raucous 60s garage-type music that I used to see quite a lot of at beer parties in garages in the, well, 60s. For the handful of you who were around Detroit in those days and are still sentient, you will of course recall that nearly every such event concluded with a five-alarm, all-sirens-blazing rendition of “Shake A Tailfeather,” and though the Tubsters didn’t dredge that one up out of their no doubt limitless repertoire, it wouldn’t have seemed the slightest bit out of place if they had. It was very much like being in the back yard of some teenager whose parents had ill-advisedly gone away for the weekend leaving Junior in charge of the premises. Except that nowadays the FBHT crew are parents themselves, and very responsible ones, too, I might add, as they bundled the teenagers from Emily’s Army out of there as soon as the kids had finished their first-ever-in-NYC set. 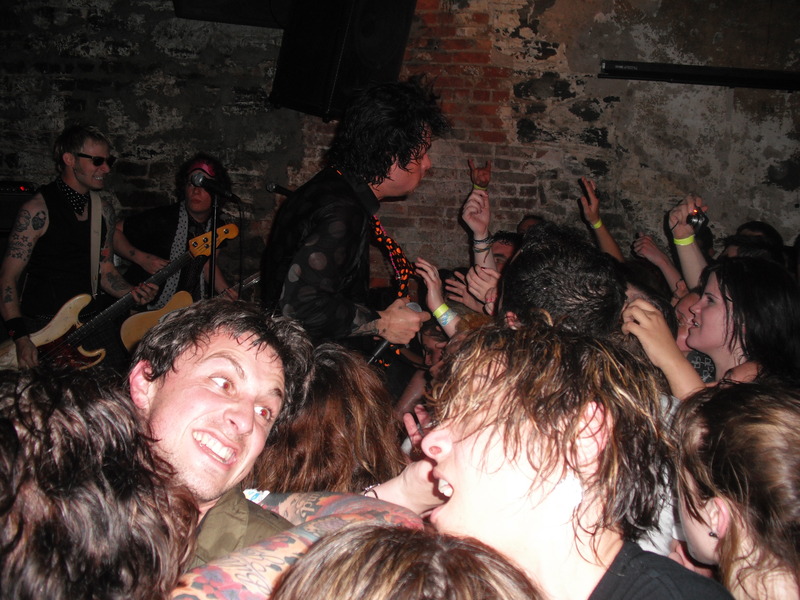 “This kind of show is not something they need to see at their age,” Billie Joe said afterward, but apart from a few – well, maybe a few more than a few – rude words and the sight of Billie kissing everyone in sight (he even planted a smacker on my lips – first time in 22 years THAT has ever happened – no tongue, though), there didn’t seem anything unduly raunchy about the affair. But it would have been past the kids’ bedtime, right? As if. Actually, seeing Emily’s Army was one of the things I was looking forward most to about this show. I’d met all but one of the kids and liked both their attitude and the songs I’d heard by them, and they didn’t pass up their opportunity to put on a show for the 200 or so (unofficially; the actual capacity is closer to 100) crammed into that Tardis-like basement (it really didn’t feel particularly crowded at all. Among the attendees, apart from the 100 or so fanatical Green Day fans who’d queued on the pavement in the rain since mid-afternoon, were most of the cast and crew of American Idiot (i.e., the Broadway musical that looks set for massive success, and deservedly so), including director and co-writer Michael Mayer, who for some reason observed from the balcony at back instead of getting down and dirty in the pit (and, at several points, on the stage) like his cast members, Tony-winner John Gallagher, Jr. rather notable among them. Or, to put it another way, if there were a Tony offered for drunken antics, Johnny and at least a couple of his pals would be well on his way to winning it, especially the one (I was introduced, but can’t for the life of me remember his name) who kept insisting that Billie Joe take him back to his house to tattoo “Raw Power” on his arm at 4 am (did you know Billie Joe traveled with his own tattoo gun? me neither). Anyway, a very fun night, made all the better by the company of Michelle Shirelle, formerly of the famous Steinways and now playing bass and singing with the Sandworms (they and 60 other bands will be at the Insubordination Fest come this June; don’t miss it! ), and if you’re wondering why, after a two or three week absence from the blogosphere I come back with this fun but seemingly inconsequential gossip-type post, never fear, I have a hefty backlog of more “important” items to be treated here in the near future. I’ve been having “issues,” you see, preventing me from doing my work. And no, they don’t all involve laziness, procrastination, and irresponsibility. All right, most of them do, but there’s other stuff as well. More later! Is this what you are talking about Larry? Really? His own Tattoo gun? Thats awesome! I wish I coulda gone but uh…..school and parents and age might be the thing that kept me from it…..also the lack of money…. Warm but not especially passionate. does he only kiss boys like in Green Day shows or girls too? He is an equal opportunity kisser, but boys do seem to take precedence. I’ve missed your updates, sir. I’ll have to check out these “Emily’s Army” people, even though just looking at them makes me feel old. I can’t remember…did you get to see the FBHT last fall in England? I was fortunate enough to catch them 2 years ago in Lotta Rock. I haven’t been the same since! I got spoiled…saw them before I ever went to a Green Day show. I definitely loves me some FBHT! 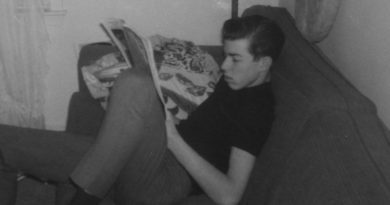 kinda been like meeting George Martin or Brian Epstein ( yes I’m aging myself). I will keep checking back as I’m very interested in your “backlog of more important items” more so than ever before! 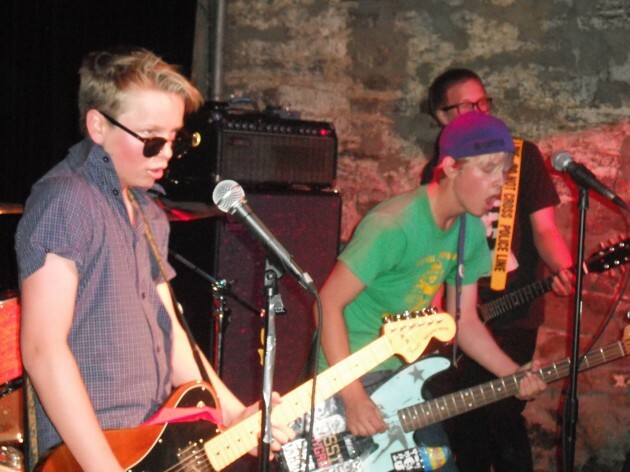 Lead kid from Emily’s Army reminds me of clips of Billie back in the late 80’s…same energy, good songs,they’re going places. No doubt look who they have as mentors, right? Did Tre teach Joey the drums?! Glad to be there at their first ever NY appearance…seeing Billie watching Joey from the sidelines, the grin on his face said it all – priceless! I know I am taking a massive chance here, but if you do njot keep moving forward you will get nowhere! Mr Livermore, my reason for this email is to enquire if you are still part and involved with Lookout! Records. I am wanting to book a concert for Greenday with the New Politics over December 2010 – January 2011 period, but cant seem to trace any agent/record label contact details from any of their respective sites. I would greatly appreciate if you could assist so that we could further negotiations regarding and event in Cape Town South Africa! We have an historical 300 year old venue or one of our new stadiums in Cape Tiwn used for the Fifa World Cup up for consideration at the moment. I would appreciate your assistance emencely! Their manager is Pat Magnarella. Good luck! Do you have an email address I could contact you on? I work for a London-based publishing house and we’re putting together an illustrated book on Green Day and I wanted to ask about getting hold of some imagery.